For the Ayria album, see Ayria. In June 2016, Horan confirmed that he was working on his debut studio album, stating "I've been in the studio writing bits and pieces. It's just for fun at the moment. I've made relationships with different writers up and down the years so I'm putting them into action now." In September 2016, it was announced that Horan had signed a solo deal with Capitol Records. Talking to the Daily Star, Horan said: "I have been working on [the album] since March 2016. It has been a year and a half in the making and it is finally time for people to hear it." In an interview with Entertainment Weekly, Horan stated that his upcoming new album was inspired by classic rock acts, including Fleetwood Mac and the Eagles. "Whenever I would pick up a guitar, I would always naturally play chords like that, and finger pick a lot and play that folky kind of style." He also described the collection as having a "folk-with-pop feel to it." In August 2017, Horan debuted several songs from the album during a live show at Shepherd's Bush Empire in London. He also revealed that he had contacted Maren Morris to contribute to his song "Seeing Blind". On 15 September 2017, Horan announced the album through his social media accounts, revealing the album's title, cover art and release date as well as the release of the third single from the album, "Too Much to Ask". The track list of the album was unveiled on 22 September 2017. Horan told Zane Lowe on his Beats 1 Radio show that the album's title track, "Flicker", means the most to him and "was a very poignant moment in the recording process", to the extent that "it changed the way I recorded the rest of the album". The album's lead single, "This Town", was released along with its accompanying music video of a live performance on 29 September 2016. It was Horan's first single outside of the boy band One Direction. Since its release, it has peaked at number nine on the UK Singles Chart, and number 20 on the US Billboard Hot 100. The second single, "Slow Hands", was released on 4 May 2017. Upon release, it received favourable reviews from critics, with Billboard describing the song as a "R&B-inflected rock tune". The single charted within the top 10 in a number of countries and reached number 11 on the US Billboard Hot 100. "Too Much to Ask" was released as the third single on 15 September 2017. The music video was uploaded to YouTube on 21 September 2017. "On the Loose" was announced as the album's fourth single on 5 February 2018. It impacted US Mainstream Top 40 radio on 20 February 2018. "Seeing Blind" was released as the album's fifth single in June 2018. An official acoustic video clip was released on 4 June 2018. To promote the album, Horan embarked on his first headlining concert tour, Flicker Sessions. The tour was announced on 10 July 2017 via Horan's social media accounts and website. The concert tour launched on 29 August 2017 at Olympia Theatre in Dublin, Ireland. Later, Horan embarked on his second tour in support of the album, the Flicker World Tour. At Metacritic, which assigns a normalised rating out of 100 to reviews from mainstream critics, the album has an average score of 64 out of 100, which indicates "generally favorable reviews" based on 5 reviews. Nick Levine of NME was positive of the album, calling its content "appealingly simple and straightforward", noting Horan's influences of Fleetwood Mac and the Eagles, concluding his review by praising it as a "promising" and "well-pitched" debut. Neil Yeung of AllMusic was similarly positive, noting Horan's "big first step" into musical maturity, finding his "own voice". Alexis Petridis of The Guardian was less positive, calling it "middle of the road" and stating that "none of it is terribly exciting"; however, while adding that it may be "easy to mock", he later contrasted its content and potential positively against that of Horan's past bandmates, Harry Styles and Zayn Malik. Upon Flicker's release, Louise Bruton of The Irish Times gave the album a two-star review (out of five). In Ireland and the Netherlands, Flicker debuted at number one. With 152,000 album-equivalent units and 128,000 copies sold in the United States, it also opened atop the Billboard 200, tying One Direction with the Beatles for the most members (three) with a solo US number-one album. Horan also became the group's third member to top the Canadian Albums Chart when the record entered at the summit with over 16,000 consumption units in the nation. Elsewhere, the album debuted at number two in Australia and Italy while opening at number three in New Zealand, Scotland, and the United Kingdom. 4. "Japan Trip Behind the Scenes"
Credits adapted from the liner notes of Flicker. ^ Levine, Nick (20 October 2017). "Niall Horan – 'Flicker' Review". NME. Retrieved 22 October 2017. ^ Hardwick, Jack (2 June 2016). "Niall Horan reveals solo plans: 'I've been in the studio with various producers'". Daily Star. Retrieved 25 September 2017. ^ Ruby, Jennifer (5 September 2016). "Niall Horan 'signs solo record deal' with Universal instead of Simon Cowell's Syco". London Evening Standard. Retrieved 25 September 2017. ^ Hardwick, Jack (1 September 2017). "Niall Horan confirms solo album Flicker: 'It has been a year and a half in the making'". Daily Star. Retrieved 25 September 2017. ^ Bacle, Ariana (4 May 2017). "Niall Horan gets funky on new track, 'Slow Hands'". Entertainment Weekly. Retrieved 25 September 2017. ^ Katie, Baillie (15 September 2017). "Niall Horan thanks fans for their birthday wishes with his solo album release date and new single". Metro. Retrieved 25 September 2017. ^ Halperin, Shirley (9 August 2017). "Niall Horan Debuts Duet With Maren Morris, Sam Smith Reveals New Album Details at Capitol Congress". Variety. Retrieved 25 September 2017. ^ Bryan, Rolli (14 September 2017). "Niall Horan Reveals Solo Album Title, Art & Release Date". Billboard. Retrieved 25 September 2017. ^ David, Kearns (14 September 2017). "Niall Horan reveals the release date for his debut album Flicker, and it's coming SOON". The Sun. Retrieved 25 September 2017. ^ Chidirim, Ndeche (16 September 2017). "One Direction's Horan Releases New Solo Album". The Guardian. Retrieved 25 September 2017. ^ Ross, McNeilage (15 September 2017). "Niall Horan Releases 'Too Much To Ask' and Reveals 'Flicker' Release Date". MTV News. Retrieved 25 September 2017. ^ Gil, Kaufman (22 September 2017). "Niall Horan Uncovers Track List for 'Flicker' Solo Album". Billboard. Retrieved 25 September 2017. ^ Scott, Sterling (22 September 2017). "Niall Horan Reveals 'Flicker' Tracklist". CBS Radio. Retrieved 25 September 2017. ^ Mike, Wass (22 September 2017). "Niall Horan Reveals The Tracklist Of Debut LP, 'Flicker'". Idolator. Retrieved 25 September 2017. ^ Johnni, Macke (22 September 2017). "Niall Horan Reveals The Song Off 'Flicker' That Left Everyone Speechless". People's Choice. Retrieved 25 September 2017. ^ Wootton, Dan (29 September 2016). "Niall Horan becomes first One Direction member to release music as he announces solo single This Town". The Sun. Retrieved 25 September 2017. ^ "Official Singles Chart Top 100 – 7 October 2016 – 13 October 2016". UK Singles Chart. Retrieved 25 September 2017. ^ Trust, Gary (1 March 2017). "Rae Sremmurd Returns to No. 1 on Hot 100, Migos Soars to Top 10". Billboard. Retrieved 25 September 2017. ^ Lockett, Dee (4 May 2017). "Harry Styles and Niall Horan's New Solo Careers Are Starting to Rival Each Other". Vulture magazine. Retrieved 25 September 2017. ^ Martins, Chris (25 May 2017). "Niall Horan Braces for Stardom Outside One Direction, With Advice From Justin Bieber & The Eagles". Billboard. Retrieved 25 September 2017. ^ Niall Horan [@NiallOfficial] (5 February 2018). "The next single from Flicker will be 'On The Loose' ! 📷: kylermartz" (Tweet). Retrieved 6 February 2018 – via Twitter. ^ "CHR Available For Airplay - FMQB". FMQB. Archived from the original on 8 February 2018. Retrieved 7 February 2018. ^ "THE PURGE #336". auspOp. 5 June 2018. Retrieved 6 June 2018. ^ "Niall Horan, Maren Morris - Seeing Blind (Acoustic)". YouTube. 4 June 2018. Retrieved 6 June 2018. ^ Reed, Ryan (10 July 2017). "Niall Horan Plots Intimate 'Flicker Sessions 2017' World Tour". Rolling Stone. Retrieved 25 September 2017. ^ Bell, Sadie (10 July 2017). "Niall Horan Announces Worldwide Tour". Billboard. Retrieved 25 September 2017. ^ a b "Reviews for Flicker by Niall Horan". Metacritic. CBS Interactive. Retrieved October 23, 2017. ^ Yeung, Neil. "Flicker - Niall Horan". AllMusic. Retrieved 23 October 2017. ^ Petridis, Alexis (19 October 2017). "Niall Horan: Flicker review – awwww-inspiring Radio 2 filler". Retrieved 23 October 2017 – via The Guardian. ^ Gill, Andy (19 October 2017). "Album reviews: Niall Horan - Flicker, Pink - Beautiful Trauma, Destroyer - Ken". The Independent. Retrieved 25 October 2017. ^ a b Bruton, Louise (20 October 2017). "Is Niall Horan's album any good? The verdict on Flicker". The Irish Times. Retrieved 25 October 2017. ^ NME. "Niall Horan – 'Flicker' Review". Retrieved 23 October 2017. ^ McCormick, Neil (20 October 2017). "Niall Horan, Flicker, review: homespun MOR from One Direction's dark horse". The Telegraph. Retrieved 25 October 2017. ^ a b "Irish Albums Chart: 27 October 2017". Irish Recorded Music Association. Retrieved 28 October 2017. ^ a b "Dutchcharts.nl – Niall Horan – Flicker" (in Dutch). Hung Medien. Retrieved 27 October 2017. ^ Caulfield, Keith (29 October 2017). "Niall Horan's 'Flicker' Debuts at No. 1 on Billboard 200 Albums Chart". Billboard. Retrieved 30 October 2017. ^ Caulfield, Keith (29 October 2017). "One Direction Matches The Beatles as Only Groups With Three Members With Solo No. 1 Albums". Billboard. Retrieved 30 October 2017. ^ "Tragically Hip Still Dominate Top 200 Albums Chart". FYIMusicNews. 29 October 2017. Retrieved 30 October 2017. ^ "P!nk holds #1 for second week with Beautiful Trauma". Australian Recording Industry Association. 28 October 2017. Retrieved 28 October 2017. ^ a b "Album – Classifica settimanale WK 43 (dal 2017-10-20 al 2017-10-26)" (in Italian). Federazione Industria Musicale Italiana. Retrieved 28 October 2017. ^ a b "NZ Top 40 Albums Chart". Recorded Music NZ. 30 October 2017. Retrieved 27 October 2017. ^ a b "Official Scottish Albums Chart Top 100". Official Charts Company. Retrieved 28 October 2017. ^ Myers, Justin. "George Michael's Listen Without Prejudice back at Number 1 after 27 years". Official Charts Company. Retrieved 27 October 2017. "Flicker by Niall Horan on iTunes". iTunes Store. Retrieved 25 September 2017. "Flicker (Deluxe) by Niall Horan on iTunes". iTunes Store. Retrieved 25 September 2017. "Niall Horan – Flicker – Amazon.com Music". Amazon.com. Retrieved 25 September 2017. "Niall Horan – Flicker [Deluxe Edition] – Amazon.com Music". Amazon.com. Retrieved 25 September 2017. "Niall Horan – Flicker [Regular Edition] [Japan Bonus Track]". CDJapan. Retrieved 9 October 2017. "Niall Horan – Flicker (Target Exclusive)". Target. Retrieved 25 September 2017. "Niall Horan – Flicker (Deluxe Edition) [w/ DVD, Limited Edition] [Japan Bonus Track]". CDJapan. Retrieved 19 October 2017. ^ Flicker (Media notes). Niall Horan. Neon Haze Music / Capitol Records. 2017. ^ "ARIA Australian Top 50 Albums". Australian Recording Industry Association. 30 October 2017. Retrieved 28 October 2017. ^ "Austriancharts.at – Niall Horan – Flicker" (in German). Hung Medien. Retrieved 1 November 2017. ^ "Ultratop.be – Niall Horan – Flicker" (in Dutch). Hung Medien. Retrieved 27 October 2017. ^ "Ultratop.be – Niall Horan – Flicker" (in French). Hung Medien. Retrieved 27 October 2017. ^ "Niall Horan Chart History (Canadian Albums)". Billboard. Retrieved 31 October 2017. ^ "Czech Albums – Top 100". ČNS IFPI. Note: On the chart page, select 201743 on the field besides the word "Zobrazit", and then click over the word to retrieve the correct chart data. Retrieved 7 November 2017. ^ "Hitlisten.NU – Album Top-40 Uge 43, 2017". Hitlisten. Retrieved 1 November 2017. ^ "Niall Horan: Flicker (Deluxe)" (in Finnish). Musiikkituottajat – IFPI Finland. Retrieved 30 October 2017. ^ "Lescharts.com – Niall Horan – Flicker". Hung Medien. Retrieved 30 October 2017. ^ "Offiziellecharts.de – Niall Horan – Flicker" (in German). GfK Entertainment Charts. Retrieved 27 October 2017. ^ "Top-75 Albums Sales Chart Week: 50/2017". IFPI Greece. Archived from the original on 29 December 2017. Retrieved 27 August 2018. ^ "Oricon Top 50 Albums: 2017-10-30" (in Japanese). Oricon. Retrieved 27 August 2018. ^ a b "Los más vendidos 2017" (in Spanish). Asociación Mexicana de Productores de Fonogramas y Videogramas. Archived from the original on 30 June 2018. Retrieved 5 February 2018. ^ "VG-lista – Niall Horan". VG-lista. Retrieved October 28, 2017. ^ "Oficjalna lista sprzedaży :: OLiS - Official Retail Sales Chart". OLiS. Polish Society of the Phonographic Industry. Retrieved 2 November 2017. 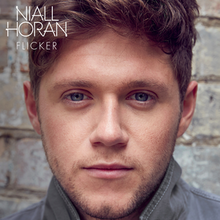 ^ "Portuguesecharts.com – Niall Horan – Flicker". Hung Medien. Retrieved 4 November 2017. ^ "2017년 42주차 Album Chart" (in Korean). Gaon Music Chart. Retrieved 30 October 2017. ^ "Top 100 Albumes — Semana 43: del 20.10.2017 al 26.10.2017" (in Spanish). Productores de Música de España. Retrieved 9 November 2017. ^ "Swedishcharts.com – Niall Horan – Flicker". Hung Medien. Retrieved 28 October 2017. ^ "Swisscharts.com – Niall Horan – Flicker". Hung Medien. Retrieved 1 November 2017. ^ "Official Albums Chart Top 100". Official Charts Company. Retrieved 28 October 2017. ^ "Niall Horan Chart History (Billboard 200)". Billboard. Retrieved 9 November 2017. ^ "Jaaroverzichten 2017" (in Dutch). Ultratop. Retrieved 21 December 2017. ^ "Jaaroverzichten – Album 2017". Hung Medien. Retrieved 23 December 2017. ^ "ARIA Charts – Accreditations – 2018 Albums". Australian Recording Industry Association. Retrieved 13 January 2018. ^ "Brazilian album certifications – Niall Horan – Flicker" (in Portuguese). Associação Brasileira dos Produtores de Discos. Retrieved 11 April 2018. ^ "Canadian album certifications – Niall Horan – Flicker". Music Canada. Retrieved 22 November 2017. ^ "One-off Niall Horan special performance with RTE Orchestra to be broadcast this Saturday". The Irish Post. Retrieved 17 July 2018. ^ @Amprofon (15 January 2018). "Publicado el 11 de enero del año pasado, el álbum #Flicker de @NiallOfficial llega al #DiscoDeOro en #México" (Tweet). Retrieved 15 January 2018 – via Twitter. ^ "Norwegian album certifications – Niall Horan – Flicker" (in Norwegian). IFPI Norway. Retrieved 17 July 2018. ^ "Guld- och Platinacertifikat" (in Swedish). IFPI Sweden. Retrieved 15 December 2017. Type Niall Horan in the top right search bar. Click on "Sok" and select "Visa" under Flicker to see certification. ^ "British album certifications – Niall Horan – Flicker". British Phonographic Industry. Retrieved 26 May 2018. Select albums in the Format field. Select Gold in the Certification field. Type Flicker in the "Search BPI Awards" field and then press Enter. This page was last edited on 9 March 2019, at 19:28 (UTC).